RENAULT CD RADIO PLAYER. GRAND SCENIC. SHOULD YOU REQUIRE A SECURITY CODE FOR THIS CD PLAYER ONE YOU HAVE I CAN CODE IT FOR YOU. SUPPLIED WITH SECURITY CODE. PICTURES ARE FOR ILLUSTRATION PURPOSES. Tested and working w ithcode. TO UNLOCK YOUR RENAULT RADIO WE NEED THE 4 DIGIT SECURITY CODE ON A STICKER ON THE TOP OR SIDE OF THE RADIO. 1 LETTER FOLLOWED BY 3 DIGITS. FOR EXAMPLE ‘A118’. RENAULT RADIO CODE SERVICE. You can unlock the radio in your Renault Car or Van from the fifteen digit bar code number beginning with82 ,77 or28. You will find this number printed on a label on the back of the radio. LAGUNA AND KANGOO. RENAULT CD RADIO PLAYER. SHOULD YOU REQUIRE A SECURITY CODE FOR THIS CD PLAYER ONE YOU HAVE I CAN CODE IT FOR YOU. SUPPLIED WITH SECURITY CODE. WILL FIT ONLY IF YOU HAVE A DISPLAY WHICH SITS SEPERATE ABOVE IN THE DASHBOARD. RENAULT MEGANE MK II 2005-2008 CD PLAYER UPDATE LIST! THIS IS AN UPDATE LIST CD PLAYER AND WILL ONLY FIT IN CARS 2005 ONWARDS. FOR SALE IS A CD PLAYER CODE AS SHOWN ABOVE IN PHOTOGRAPH. PART NUMBER AB30-38, AB44-56, IV1-28, IV30-39, IV52-54, IV63, KW1-14, PA21-40, PH15-26, PH30-41, PH49-50. RENAULT CLIO MK3 TOM TOM SAT NAV SCREEN AND UK TOM TOM SD CARD. LIGHT SCRATCHES TO THE PLASTIC CASING OF SCREEN BUT NOTHING MAJOR. RENAULT RADIO CODE SERVICE. THIS SERVICE COVERS 99.9% OF RENAULT STEREOS. ALL I NEED FROM YOU IS THE SERIAL LOCATED ON THE SIDE STICKER OF YOUR CAR STEREO. THE BEST WAY TO GET A QUICK RESPONSE IS TO SEND US A PICTURE OF YOUR SERIAL NUMBER AND A PICTURE OF TGE FRONT OF THE STEREO. RENAULT MEGAN 3 III car cd radio stereo player. Cds &radio fm,am tuner. this car radio is original for. RENAULT Clio III car cd radio stereo player. part number 2811 500 38R. Renault part number 2811 500 38RT. this car radio is original for Renault Clio 3 new version. its genius part of Renault. cds &radio fm,am tuner. Has a radio code. Shelf location: RADIO. Removed from the vehicle below but may fit other models/years. Wing Mirror Type. Screws, nuts and bolts are also classed as a free gift if included. Option can be added at checkout. WORKS WITH RADIO DISPLAY. FITS 2001 2002 2003 2004 MODELS. IN FULLY WORKING ORDER UNIT HAS BEEN SERVICED. Renault Clio CD player car Stereo -. Fits Renault Clio: 2009 - 2012. This head unit fits: Renault Clio: 2009 - 2012. faulty factory fit car stereo. Installation is plug and play. The stereo is provided with 3 mo nths warranty; radio code and radio. FOR SALE IS A CD RADIO UNIT FOR A RENAULT KANGOO 2008-2013 MODEL. CAR MAKE: KANGOO II. RADIO IS IN GREAT WORKING CONDITION AND IS SOLD AS SEEN IN PHOTO. PART NUMBER:281112231R. IF YOU REQUIRE HELP WITH COMPATIBILITY OR YOUR NOT SURE IS THIS WILL FIT MSG OR WITH YOUR REG AND I WILL HELP YOU AS MUCH AS I CAN. Dacia Sandero 2012 onwards. Dab Antenna. Dacia Logan 2013 onwards. Dacia Dokker/Lodgy 2012 onwards. 7" All-in-One Design for Renault/Dacia/Lada Cars with built-in CanBus Decoder (it cost GBP30 in the market). Excellent working condition. Must be Tuner List (NOT UPDATE LIST). Colour- Grey as shown in photo. It's genuine original stereo of Renault Laguna. radio sat nav unit & 6cd changer & screen. 6cd changer. you will get all that parts that you see in photos as. Renault Laguna 3 Update List CD player -. Fits Renault Laguna: 2007 - 2014. This head unit fits: Renault Laguna: 2007 - 2014. Genuine Renault Part. FM / AM Radio Tuner. Peugeot Expert car stereo RD4 car radio stereo | RD4 stereo for Peugeot. RENAULT CD RADIO MP3 USB AUX BLUETOOTH CAR STEREO. SUPPLIED WITH SECURITY CODE. COMPATIBLE WITH TOM TOM SAT NAV SCREEN IF YOU HAVE ONE FITTED. Genuine RADIO CD PLAYER 8200633639. 2007 RENAULT TRAFIC 2.0 Dci 115 sl27. Model: 2007 Renault Trafic 2.0 Dci 115 sl27. Body Type: Van, MK II facelift model 2006-2014. Cash only if collected in person! Faulty factory fit car stereo. Installation is plug and play. The stereo is provided with 3 mo nths warranty & radio code. VW RCD 300 Caddy CD player | Caddy car stereo radio. Wrong Item received / Faulty Item. Renault Trafic CD player car Stereo -. Fits Renault Trafic - 2010 - 2013. This head unit fits: Renault Trafic: 2010 - 2013. faulty factory fit car stereo. Installation is plug and play. The stereo is provided with 3 mo nths warranty; radio code and radio. I DONT HAVE THE CODE FOR THIS. THIS IS IN GOOD USED CONDITION. RENAULT CD PLAYER + SECURITY CODE. Renault Grand Espace 2003 2004 2005 2006. Fits Renault Laguna 2001 2002 2003 2004 models. all my cd players will be in similar good condition to the ones in the picture. This cd player is supplied with the 4 DIGIT SECURITY PASS CODE. RENAULT LAGUNA MK3 CD RADIO PLAYER. FITS THE RENAULT LAGUNA. WILL WORK WITH YOUR IN DASH RADIO DISPLAY IF YOU DONT HAVE THIS DISPLAY. IN THE CENTER OF YOUR DASHBOARD THIS STEREO WILL NOT FIT. SUPPLIED WITH SECURITY CODE. REMOVED FROM A 2002 Renault Clio 172. ANY MILEAGE RECORDED IS FROM THE VEHICLES SPEEDO PRIOR PART REMOVAL. Renault clio sport 182 cabasse cd player radio head unit tuner list, removed from a 2004 182 working fine. FOR SALE IS A CD RADIO UNIT FOR A RENAULT KANGOO 2008-2013 MODEL. CAR MAKE: KANGOO II. RADIO IS IN GREAT WORKING CONDITION AND IS SOLD AS SEEN IN PHOTO. PART NUMBER:281159665R. YEAR: 2008-2013. FOR SALE IS A RENAULT MASTER MK3 2016 PLAYER WITH PART NUMBER 281155360R. ALSO FITS MOVANO AND NV400 MODELS. All our used parts are fully inspected tested and cleaned prior to dispatch, and carry a minimum of 3 months warranty. Tested and works fine as shown. Renault Kangoo Clio Update List With Display Car Radio Stereo Cd Player Code. Tested and works fine as shown. Part number: 8200446233T. We are Breaking A2008 Renault Twingo GT Tce 100 MK2 (Pre-Facelift). Engine Code: D4F780. Paint Code: NV676. Screws, nuts and bolts are also classed as a free gift if included. 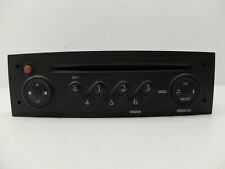 Renault Master CD player car Stereo -. Fits Renault Master: 2011 - 2014. This head unit fits: Renault Master: 2011 - 2014. faulty factory fit car stereo. Installation is plug and play. The stereo is provided with 3 mo nths warranty; radio code and radio.